For a few days now, strange things had been happening not only in Neopia, but also on Earth. 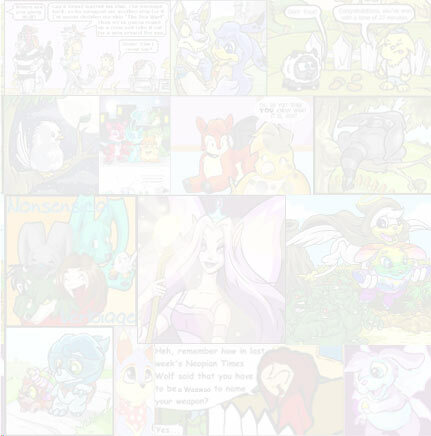 People and NeoPets were disappearing mysteriously. Nobody knew what was going on. But as usual, Doomsday_Rider rose to the challenge. However, our story does not begin in Neopia. It begins in the Dark Dimension, where Prince Zing-Lau, Mechanicore, and ShenDogg lie in wait. "Zing-Lau, when do we get out of here?" ShenDogg asked. "As soon as I can figure out how to make the encantation work," Zing-Lau answered, reciting an encantation. "I've got the encantation to work at last. Let's see where the first rip leads to." Zing-Lau stepped through, followed by Mechanicore, followed by ShenDogg. A few seconds later, they dropped onto the street of a city. "Where are we?" Mechanicore asked. "We're in Neopia," Zing-Lau said. "This city is very starange, it's called Metro City. I've been here before." "It really doesn't look too bad," ShenDogg said in awe. "Yes, well, the people that live here aren't exactly friendly toward invaders," Zing-Lau said. Psychodogg happened to be walking by, and he saw Prince Zing-Lau. "Oh, it's you. Didn't you give up when Doomsday_Rider and his friends beat you the second time?" "Who are you?" Prince Zing-Lau asked. "I'm Psychodogg, owner of Boomdogg, the base for ShenDogg," Psychodogg answered. "You're that wretched Lupe's owner?" Zing-Lau questioned. "I just said that," Psychodogg answered, crossing his arms. Zing-Lau charged at him, and threw a rapid-fire assault of punches. Psychodogg managed to block most of them, but a few did hit their target. "I don't know why your power is equal to mine. After all, I am the Phoenician prince," Zing-Lau said, slowly backing away. "Twice defeated, I might add," Psychodogg said. "Shut up!" Zing-Lau shouted. "This time I will NOT be defeated! Do you hear me? Mark my words, I will not lose again!" He shouted as he, Mechanicore, and ShenDogg all disappeared. "I've got to tell Yugo about this," Psychodogg said, running through the city. The doorbell rang. I slid out of my seat and walked to the door. I was still half asleep, and Yugo was still sleeping. I opened the door. "Hey, Doomsday_Rider. Is Yugo here?" Psychodogg asked. "Just a minute," I answered, turning around and going upstairs to Yugo's bedroom. I opened the door, walked in, and shook Yugo slightly. "What is it?" Yugo said, a little grumpily. He doesn't like to be awakened. "Psychodogg's at the door," I said. Yugo snapped to attention, jumped out of bed and hurriedly got dressed, then ran past me down to the door. "Yugo, you're not going to believe who I just saw," Psychodogg said. "Do the names Vipor and Achinarak strike a tone?" Psychodogg asked. "You're kidding!" Yugo practically shouted, his eyes wide with surprise. "If I was kidding, would I look this serious?" Psychodogg asked. "Good point, Psy," Yugo said. "You don't suppose he's somehow tied in to all the disappearances lately?" Psychodogg asked. "Knowing him, probably," Yugo answered. "He must be pretty strong this time. 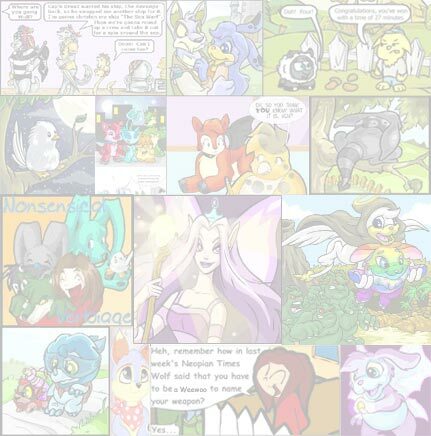 Boomdogg told me the Lupe prince, Squire, is one of the missing NeoPets," Psychodogg explained. Squire was in a glass tube, hitting it, trying to break free. "It's no use, Squire," Zing-Lau said. "You will not get away with this!" Squire shouted. "Want to bet? I don't see your father anywhere," Zing-Lau said, arrogantly glancing around the room. "Just you wait!" Squire shouted. "Well, even if he does come here, he will be no match for me," Zing-Lau said. "Yes he will!" Squire shouted. "No he won't," Zing-Lau answered. "And why not?!" Squire demanded. "Four thousand years ago, a beast known as Tuturis ruled all of Phoenicia. He was invincible. But an invincible warrior fought Tuturis, and Tuturis was sealed in an eggshell, which was hidden away deep within a planet. The legends say that that planet is either Neopia or Earth. The only way to reawaken Tuturis is to sacrifice enough life for his unimaginable energy to return. My estimate is that I only need to sacrifice two lives: your father's, and Shadow's," Zing-Lau explained. "Shadow?" Squire asked himself, sitting down. Squire knew he had heard the name Shadow before, but he just couldn't quite place where. "Who's Shadow?" "He used to be one of my top soldiers the first time I invaded this planet. I destroyed him, and somehow he returned to life," Zing-Lau answered. "Oh, you mean Majin Shadow," Squire corrected. "So, now he's Majin Shadow?" Zing-Lau muttered to himself. "Well, now it's time to begin the rebirth process," Zing-Lau said, turning and walking toward a screen. "Mechanicore, what is the access number?" "Right." Zing-Lau typed the number into the keypad. It slid back, revealing an old, decaying scroll. He began to read it aloud. "A sub ethereal inferno guards the shell of the demon. The destruction of the viper and the shadow cast aside the shackles of eternal imprisonment. The three seeds of perfection return to a whole." As Zing-Lau recited the spell, an eternal darkness began to settle upon Neopia and Earth. The dimensional rips were torn open even wider, and Neopia and Earth began to rumble violently. "At long last, it has begun," Zing-Lau said to himself. "Oh, this doesn't look good," Anubis whispered to himself. It had been years since there was darkness in the sky over the San-Katahn Forest. "I bet there's something about this in the Contra Jungle," he said, looking up at the sky, being fascinated about the looming darkness. "You're not leaving if I have anything to do with it," Squire said, dropping from a tree. "Squire!" Anubis said, gritting his teeth. The two had always had friction between them, mainly because Squire kept saying the San-katahn Forest belonged to him. "What are you doing here?" Squire asked, tilting his head back. "You're trespassing on my property." "Squire, we've been over this. I'm the guardian of this place, and that is that," Anubis said. "Fine then, if you won't leave the forest, I'll have to prove I own it by force," Squire vaunted. "Squire, i've lived here since before you were born. I don't want to fight you, but I will if I have to," Anubis said. "Then so be it!" Squire shouted. "The winner of this fight shall claim all of the San-katahn Forest." Squire rushed Anubis, and punched him right in the face. Anubis jumped back, exaggerating the force of the hit. Anubis began to shape-shift into a form that required a lot of energy. His eyes began to glow blue, and his entire body was shaking from the effort of trying to gather enough energy for the transformation. He changed into a scorpion, and then tried to combine his current form with a human. In other words, he was shape shifting into Scorpio. When he finished changing forms, his eyes returned to normal and his arms dropped to his waist. Anubis began to lunge at Squire repeatedly, snapping down his stinger randomly to try and slice open Squire, although Squire was moving far too fast to be hit by it. "Is that all you've got?" Squire asked, rushing forward, and shin-kicking Anubis in the knee. Squire grabbed Anubis' leg and tail, leapt into the air, and turned so that when they hit the ground, it would snap Anubis' head back right between his shoulder blades. The attack went off without a hitch, and Anubis returned to his normal form on contact. He lay defeated on the ground, a stream of red surrounding him. "And you call yourself the ultimate shape-shifter," Squire said, laughing. He turned around, turning his attention to the river just outside the forest. "Big mistake!" Anubis shouted as he stood up and began to shape-shift into Belgora. The spikes in his body were the first things to appear. Then the red streak on his back and the black ring around his waist. Squire spun around and stared Anubis in the face. The blood had gone away, but Anubis still felt the pain where it had started. Four red balls of light began to gather around Anubis. "Energy Bomb!" he shouted as all four of them turned green and shot at Squire. He dodged three of them, but the third and fourth ones were so close together, he didn't have enough time to get away before it hit. The force of the Energy Bomb sent Squire flying into a tree. Squire used the tree as a wall, leapt off of it and rushed at Anubis. Anubis shot a white fireball at Squire and it hit its mark. Squire dropped to the ground a few inches from where he got hit, and he slowly fell unconscious. Squire awoke in the hospital, and when he realised what had happened, he sat straight up with a fire in his eyes. "I want Anubis III arrested and put inot the pound!" Squire shouted. Anubis was minding his own business when a steel cable wrapped around him. He struggled to break free, but when he almost had the cable undone, he was shocked with a taser, and fell into unconsciousness. Next time on Doomsday Rider VI, Boomdogg and ShenDogg lock horns yet again. What's this? A clear blue Shoyru has gotten confused with Doomsday_Rider, and he is on the run! Could it be Tuturis? Find out next time.